The bright green flowers of Anigozanthos Royal Cheers will last for several months on the plants. This is also great cut flower. Thedistinctive look of the Kangaroo Paws will catch the attention of even the most discerning gardening snob. This is a great addition to the perennial border in areas that are irrigated with drip irrigation. There is a black fungus that gets going on the iris-like leaves if the plants are watered with spray type irrigation, and this is hard to get rid of. It is caused by excessive overhead watering. I usually put them on a drip system and water them infrequently once established. This dwarf cultivar gets to about 2 feet tall. It is hardy to the high 20's. It will grow in some shade but performs better in full sun. 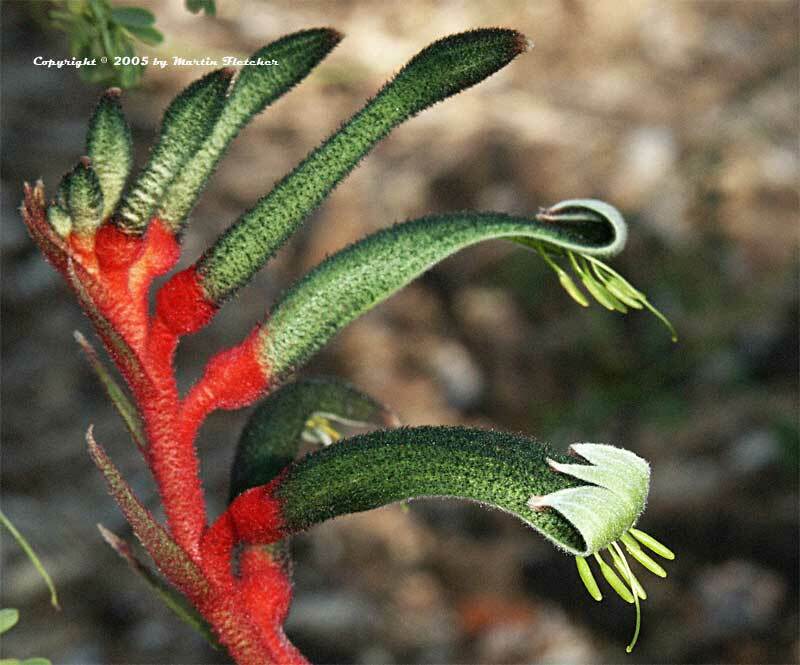 Flowers and foliage of Anigozanthos Royal Cheer the Royal Cheer Kangaroo Paws. High resolution photos are part of our garden image collection.